The property was smaller than we thought but comfortably supported a family of 6. We really enjoyed the lodge portion where we sat outside on a great deck, played games and ate with the larger family. See number 5. To reiterate , the married couple were friendly and accommodating. We have stayed at Chateau a number of times with extended family and will likely return because of that. We feel that the rentals are overpriced but realistically I think if we looked for other accommodations we'd also find them to be "north shore over priced" We love being on the east side of highway 61 and the access to the rocky shore by nice stairway. We love the access to bike trails right from the driveway. The cabin is great for sharing with someone else with the separation of the bedrooms and having two baths. Loved the master bedroom for its views of the water although it could use a new mattress. Very helpful and friendly - excellent people at Cascade. The house and the guest house are wonderful - great location between Lutsen and Grand Marais, very close to the water which we love, comfortable and pretty and all the amenities included. Also very clean. The team members were extremely helpful when I called. The cottage was perfect, everything I needed in a comfortable, compact space. Very clean and roomy. However, layout was not conducive for even a medium size gathering of people. Kitchen was very nice and bedrooms were comfortable. Plenty of bathroom amenities. The house was wonderful. 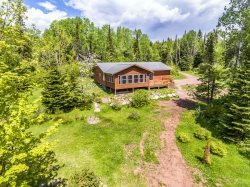 Perfect for 5 adults and nicely located between Tofte and Lutsen. One of our all time favorite vacations. Property was great and with a spectacular view. Great location. Close to everything Grand Marais has to offer. The online system is great. It is also nice to not have to go to a different location to get the key. We like the key box..
We like Opels #2. The only thing we wished for was a hair dryer. We liked that there was a heater for the chilly nights. The cabin, as always, was clean and comfortable. We like that there are not a lot of things hanging from the walls -- it is not cluttered. Great place with a great view. Very hospitable. We loved it. Had a wonderful time with my wife and my two girls. My youngest loved being by the water. And the waves were such a sight to see. On our last day. The waves got so big that when it crashed against the wall. It would splash up about 20ft in the air. Am planning on booking this place again next summer. This time for a week! !